A golf putting green for your home is not only great fun but they generally do help your short game. They come in a range of various types and size with many having an incline or even a ball return for more enjoyment. The best indoor putting green is the Putt-A-Bout Grassroots Par Three that offers 3 holes, sand traps and excellent value for money. The kidney-shaped green also provides uniqueness to make putting slightly harder for the other holes. Of course, for those looking for the most lavish putting greens, there are excessively large putting green for your home. These come with various holes and challenges but can also be used outside as well as indoors. 5 What Makes The Best Putting Green? The larger the putting green does not mean its a better putting green. It just means that it will take up more space inside your home. The best putting greens will make the most of every inch of the synthetic putting green with various target holes. Putting green are usually made from a synthetic material that is long lasting. The problem occurs when you roll the putting green up for storage and poor quality greens held together by glue may pull apart. Be sure to check the warranty length that many manufacturers offer. Below is a list of the best indoor putting greens for fun and practising. They come in a range of large to small greens, ball returns and other features. The Putt-A-Bout putting green has three targets holes that are surrounded by sand bunkers to provide you with a testing putt. The bunkers also act as a ball catcher to prevent your golf balls rolling all over the place. In terms of difficulty, there is a slight incline at the end of the putting green and the kidney shape makes the far left target much harder. This style of putting green is favoured over the standard straight greens as its more fun. This is a small putting green at 9 foot long and 3 foot wide and can be easily rolled up for storage when not in use. 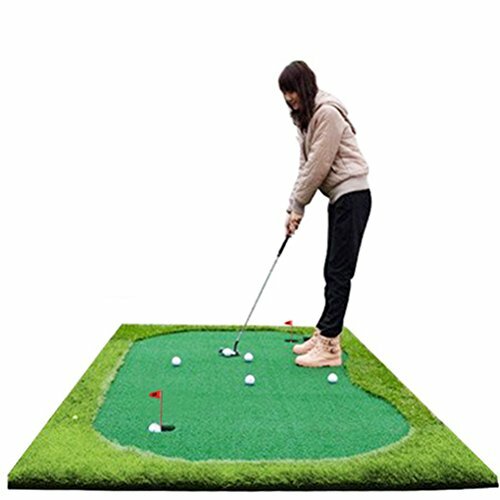 Overall, the Putt-A-Bout putting green is cheap and cheerful with three separate target holes, ball traps, incline and high-quality synthetic polyester. It is the best cheap indoor putting green that is great for all ages. The SKLZ Accelerator Pro is not only a high quality putting green but it also offers putting aids to practice your swing and power. There is only one hole that is dead straight, which is ideal for those looking to pinpoint their straight putts. To reduce interruption and the mundane walking back and forth to collect the ball, SKLZ added a ball return feature to the green. This ensures you can maintain your focus and keep consistency at the highest possible point. On the putting green are three alignment guides at 3, 5 and 7 feet. The purpose of this is to increase consistency of your putting from the squaring of the face, swing and the contact with the golf ball. Thanks to an upslope at the target hole, the green acts as a normal golf course should for a true roll surface. The SKLZ Accelerator Pro can be used by all ages but it is most suited for golfers looking to improve their consistency. The dimensions of the SKLZ Accelerator Pro are 9 foot long by 1.35 foot wide. Overall, it is the best home putting green with ball return and is great for golfers looking to improve their putt. A large putting green can improve your fun massively but only if you have the space available. The 77tech version is 10 foot long and 5 foot wide, which is much wider than the majority of putting mats. There are three target holes to choose from that are on opposite sides of the mat instead of next to each other. Each hole comes with its own flag, which is a nice touch by 77tech. The whole of the putting green is of very high quality with 77tech stating that it should last at least 5-8 years. It is the only wrap which has both a green and a rough, where the green in 10mm thick and the rough is 35mm thick. The 77tech Large Golf Putting Green is on the expensive side but is the best large putting green for indoor use. What Makes The Best Putting Green? Indoor putting greens are great fun and mean that you do not need to leave your house to practice your putting skills. Not be confused with putting machines with ball returns, the putting green is a synthetic mat with target holes and obstacles. There are hundreds of variations you can choose from that range from the number of targets, green type, obstacles, alignments, storage and of course the size. Looking into these factors in more detail should help you choose the best indoor putting green to buy. A large putting mat would be great but with the size comes with many complications. For starters, will you have an adequate amount of space to place the mat completely flat without any creases? Failing to do this can ruin the smoothness of the ball roll. However, larger putting mats will contain more targets, longer putts and generally more fun to play around with. Usually, they will cost slightly more but only by a small amount. Indoor putting greens should allow the ball to roll straight without any disturbance at all. No bumps, breaks, slants or creases on the synthetic grass as well as being hard enough to iron out any defects on the place it is laid out on. Failing to perfect this can mean the ball will go off track and is not a true reflection to putting on a proper golf course. Often, cheaper golf putting mats can become creases when storing it incorrectly. By storing it wrongly such as to tightly, you can say goodbye to a true golf ball roll. Golf mats do not suffer from rough usage but the main reason they do suffer poor durability is under storage. To save space when storing a putting mat, many owners will simply roll it up as tight as possible and force it into a small location. This is possibly the worst thing you can do to an indoor putting green and it will never be the same again. If you take care of it, you can see over 10 years of use easily and many manufacturers give lengthy warranties because there is not a lot to go wrong with them. If you know its a pain to set something up, you avoid using it. However, the majority of indoor golf putting greens are easy to set up and store. They usually roll in to place without any force required by the user. When setting up your indoor putting mat, try to find a smooth and flat surface because big defects will affect the ball roll. Storing your putting mat is easy too because they are so lightweight. However never roll them up too tight or force them into a storage location. Some putting mats for home use are ridiculous prices but the best-putting greens in the list above are all reasonably priced. I have seen some manufacturers wanting thousands for what is simply a synthetic carpet with patterns and target holes. With additional features comes additional prices but many come with warranties for peace of mind. If you want one for a gift for a golfer or just a bit of fun, the Putt-A-Bout is a great and cheap buy. For the professional golfer looking for the best putting green you can buy, the SKLZ Accelerator Pro provides putting aids. 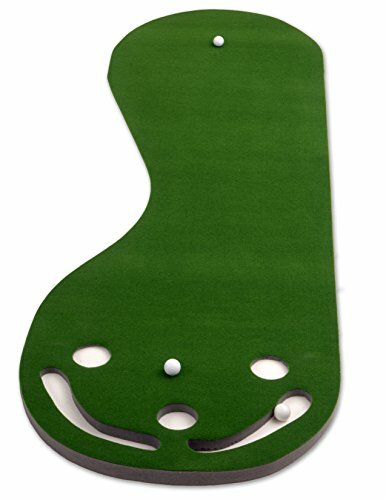 The putting mat sold by 4.25 inches is a unique one with a more complex look. Like the SKLZ there is a feature to track visibility and an automatic ball return system. However, this putting mat also had three target holes and a higher quality putting mat that is 10 foot long and 1 foot wide. The matting used on this putting green is made from a non-slip coating material that also acts as an anti-wrinkling mat. This is useful for when its stored for long periods as low-quality mats can contain lumps in the matting from being rolled. You also have the ability to adjust the size of the three target holes at the end of the green. The target spins to make the hole smaller or larger for different difficulties. 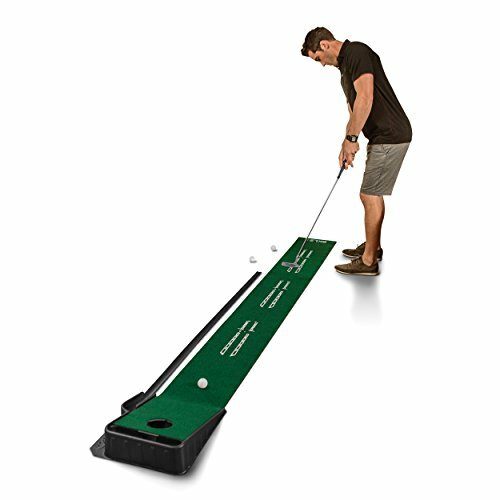 Overall, this putting mat is slightly more expensive than the others in this article but it has every feature you could possibly want. For tracking visibility of your putt, this putting green is the best buy. The COVASA putting mat has been designed to ensure you putt runs completely straight. There are two holes to aim for with one hole being smaller than the other. Regardless if you are successful or not, the ball will automatically be returned without electricity but gravity returning the ball. It is the usual size for putting mats with the green spanning 9 foot long and 1.35 foot wide. There are two different holes contain one with an auxiliary line to measure accuracy and the other is plain. In terms of storage, this putting mat has been designed to easily roll up without leaving any creases. 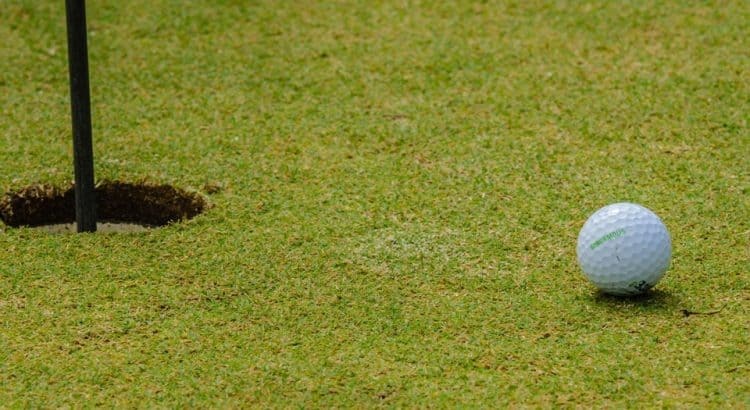 The crease defect can cause lumps in the putting green that can affect the smoothness of the putts. Overall, the COVASA putting green is excellent value for money and the best putting green for the money. It is highly rated worldwide and you can be assured of many years of usage.